If I had signed up for all the races that looked fun or challenging at the beginning of this year, I’d be broke and injured. So I kept the registrations to a minimum (although a couple of free entries and lower cost races have made for a more than usual race-filled year). With that said, I still managed to race twice in less than a week last month. WHS Cross Country Alumni meet, 2016, running to the finish! I’ve been waiting for this cross country meet all year. 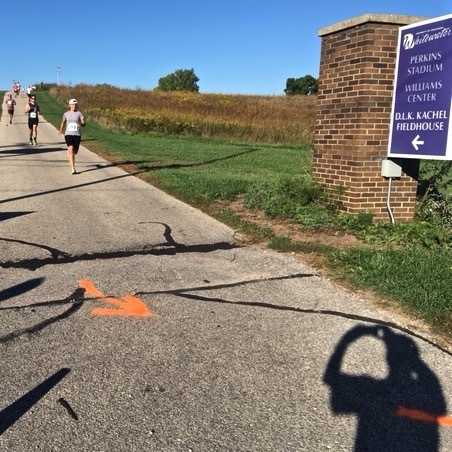 Now in its 15th year, the annual alumni race pits former Whitewater High School (Wisconsin) CC athletes against the current team in a 5K. OK, it’s not particularly cutthroat, but there are low scores to be earned and a winning team declared. Spoiler alert: The alumni won! I finished in 4th for alumni (6th place for alumni vs. current team and 7th place overall including unattached runners), meaning I scored for our team (score = adding up the overall place finishes of the top 7 runners on each team, lowest total score wins). The nostalgia continued post-race as I chatted with old high school friends, our former coach (newly crowned the namesake of said CC meet), and indulged in Rocky Rococco pizza. Jen and I had a few days of recovery time for race #1 of the 4-part Salomon Autumn Trail Series. This is our second year participating in the Salomon Autumn Trail Series (2 years ago we ran just the 4th race, last year we loved running the entire series), a lower-key trail run at Hyland Park Reserve in Bloomington, MN. Weather-wise, the night was perfect! Performance-wise, it seemed like I started out too fast for my current fitness, but I ended up placing in the top 10 for women (9 out of 65) and shaving off some time from last year’s first race. Must’ve been the new trail shoes–a pair of Nike Terra Kigers that fit more snugly than my Lone Peaks, yet still offer ample room in the toe box. A trail run with 160 other runners, some mango slices, a bottle of local beer–not bad for a Wednesday evening. I asked a co-worker about the St. Paul Trail Half Marathon earlier this year; she said it was fun and I should try it. Since she’s the most experienced trail runner of the store I thought well yeah, I should give it a try! Fast forward a few months and a series of four ‘Bluff Tuff’ runs popped up in my Facebook newsfeed–a weekly series of free training runs led by Endurance United and sponsored by Saucony (hey there old shoe friend, Saucony Peregrine) and Fleet Feet Marathon Sports (hey there oldest running specialty shop in the Twin Cities). Going into the training series I had my sights set on the full marathon. 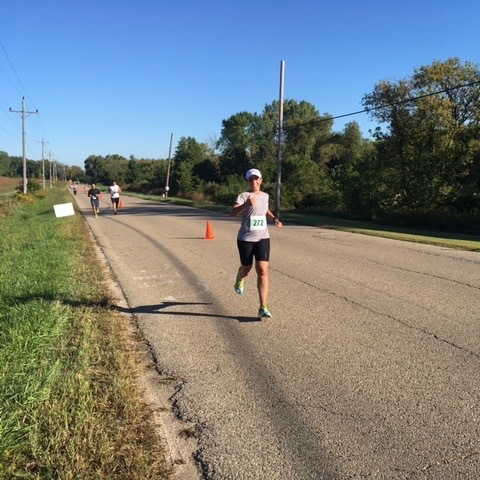 And then I ran parts of the course a couple times and realized the smart call was to run the half–still more than a handful of miles, but exponentially less pain with moderate preparation. On a rainy Saturday August morning, I hung out inside the Battle Creek Recreational Center after picking up my hand-colored bib (each of the 3 races had a different color bib) and cool race t-shirt. I debated for 45 minutes whether or not to wear my waist pack in order to carry along a bottle of coconut water/lemon juice and a few Honey Stinger gels. Fortunately I realized before lining up at the start line that an approximately two-hour race in not-t00-warm, rainy weather on a course with a few aid stations meant no need for weighing myself down with a water bottle (no matter how good that lemony coconut water would’ve tasted). I must’ve also sensed that my shorts selection for this particularly sopping wet race day was enough added weight, as they seemed to somehow absorb a little too much water for a moisture-wicking material… (whoops, old shorts!). Back to the course… The best part of the entire race! Trails! Rain! Mud! A little pavement, single-track, plenty of trees, grass, STAIRS… even the half had it all. To get an idea of just how muddy the woods were, check out this short Facebook video clip posted by one of the race organizers. Trees (to keep balanced) on the down hills and grass (for hand traction) on the up hills helped, a lot. 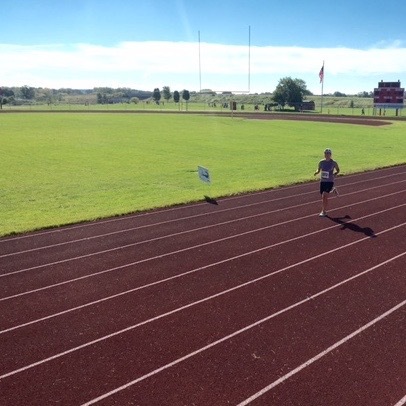 I was lucky enough to have a personal cheer crew of one–wife extraordinaire–who found me at several spots along the way and even took a few quick videos of me smiling and waving…because I love running just that much! All in all, the trail 1/2 was an incredibly fun mix of running terrain. Plus, the finish chute ended at a great brewery (Flat Earth Brewing) in St. Paul, where each runner received one free beer (or soda). 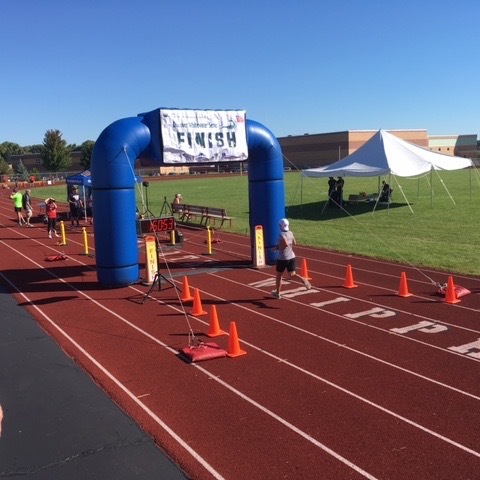 A couple days after spending two and a half days seated in a kayak for miles at a time, I ran 7 miles in the final race of the 2016 Endless Summer Trail Run Series (ESTRS) at Hyland Park Reserve in Bloomington, MN. Considering my legs weren’t feeling fresh and the air was HUMID, I enjoyed the time spent back on the trails. Wary of the heat, but knowing there’d be a water stop at mile 3.5, I debated brining along a water bottle. Fortunately I erred on the side of caution and grabbed my handheld water bottle. A little cup of Heed from the aid station and a quick soak from a water gun at the half way point helped too. The course, a ‘double lollipop’ as the race director described it, was wide enough for multiple runners and not particularly technical, primarily on grassy and wood chip terrain. On top of getting to run another midweek race, followed by a cold beer and plenty of pizza, I ran into a new friend from the aforementioned kayaking trip! A couple also came up to me after the race and said I had been their ‘unofficial’ pacer for the latter part of the race (alas, they did end up finishing faster than me). Running, a great place for meeting people! Next year, I hope to run all four of the ESTRS races. Upcoming races: The St. Paul Trail 1/2 Marathon! I ran 3 out of the 4 Bluff Tuff training runs to explore parts to the rugged course (which ultimately convinced me the full was not a…smart option this time around). After a mix of shorter races and LONG distance runs earlier this year, I’m looking forward to running (fast hiking up the steep hills) a comfortably tough distance on Saturday. Plus, the late morning (9:30) start time sounds quite luxurious. What’s the first thing you do after booking a flight… Start a packing list? Research hotels or restaurants? Those are important, but perhaps MORE importantly is finding a race to run where you’re visiting! OK, this is technically the first time I’ve done this, but I anticipate the routine becoming my new travel priority. I knew I’d be flying into Boston and then driving to New Hampshire for the weekend, ultimately spending four and a half days on the East Coast with my parents and sister (who drove TWENTY hours a few days prior to my arrival). I opened up Running in the USA and narrowed down my search to New Hampshire the weekend of July 16/17. Immediately dismissing four of five results due to their distance from our hotel in NH, I dived into learning about this “Midnight Owl” race, dubbed a prediction run in North Conway. 45 minutes from Gorham and just enough miles to make the drive worth it, I registered my sister and myself for the late night 15K. I’d never heard of a prediction run, which was perfect because I’m more often than not game for a new running adventure. Here’s how the Midnight Owl 15K works: Start anytime after 9:30 pm, NO WATCHES or timing devices allowed on the course, run the well-marked 9.3 mile course, finish as close to AFTER midnight as possible! The first five to cross AFTER midnight are the official winners. 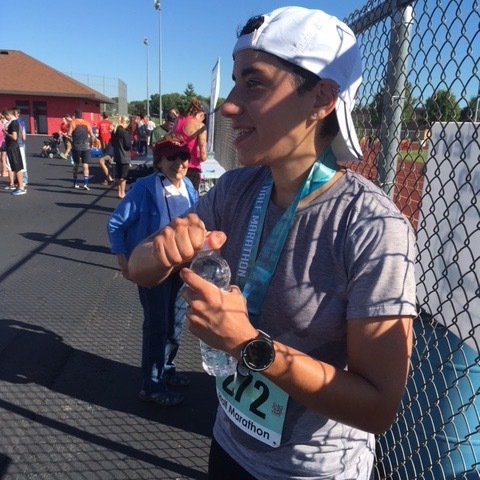 My sister (Cristina) and I went into the race moderately prepared to cross the start and finish lines together–the last time we ran together was a 5K last year–and with modest expectations to simply finish after 12:00 am (and before the 12:30 am cut-off). We prepped as well as we could while on vacation–a dinner of french fries, New England clam chowder, coleslaw, and a lobster roll a mere three hours before our race start. So, at 10:39 pm my sister and I–sporting the required reflection gear and headlamps–took off from the start “line” (no line that I can remember, but there was a clock and a guy with a clipboard) and onward around Schouler Park. Our parents made it across the park to cheer for us as we strolled down Main Street–although I may have cheered more loudly for them because I was really impressed they made it across the field before we ran past. As you may expect, knowing that each runner is allowed to choose their own start time, there was not a mass of runners to maneuver around at any point during the race. In fact, crossing paths with a moose seemed more likely (it was the North Country of New Hampshire, after all) than needing to break away from a cluster of racers. Each glowing mile marker seemed to be more of a surprise than the next. Maybe it was the novelty of running along a desolate New Hampshire (did I mention I’m originally from New Hampshire?) rural road in the middle of the night, maybe it was the cool air, or maybe it was the combination of location, temps, and company (rare occasion that I get to run with my sister). There were three aid stations stocked with water, Gatorade, and encouraging volunteers. Our anticipated pace, around 9:30/mile, was easy for me and I figured easy enough for Cristina. I typically prefer to lead (if I know where I’m going…) because it can feel like extra effort to play ‘catch up’ while running behind a person or two. So with that I let my sister lead us, to ensure she didn’t feel that extra effort of keeping my pace, and every so often casually (not casually) reminding her to stay closer to the dirt and grass on the left than to the road’s white line on our right. We finished the Midnight Owl 15K! As we entered back into town, I figured hey we’re on safer ground now, until I spotted a speeding police car suddenly barreling down the road, toward us. Unfortunately our only warning was the lights, no siren. Fortunately, we were far enough across the street to break our moderate pace for a sprint, and the officer must’ve eventually caught a glimpse of our glowing gear, that we safely parted ways (as we heard screeching tires behind us). I felt more and more energized as we ran down Conway’s Main Street, greeted by more Midnight Owlers and volunteers. As promised, we caught a glimpse of Ham Arena (the finish), but no sign of the official timing clock (the suspense continues). I assumed we were on track to finish after midnight, otherwise a heck of a lot of runners in front of use were going to ‘lose’ by finishing before 12am. We hit mile 8 and I was ready to take off, but also recognized that my sister wasn’t feeling quite the same (maybe her lobster roll was a little heavier). I backed off the pace a bit and thought some encouraging words would help. “We’re on the home stretch!” “OWL JAM!” (the chosen phrase yelled among our group during Jen and mine’s post-wedding 5K…) “This is SO MUCH FUN!” Cristina promptly told me to shut up. Thoroughly amused, I ceased my pep talk as we ran down the final stretch and around a corner to the finish shoot… 4 minutes after midnight. Perfect! Shockingly, 23 people finished between midnight and before us at 12:04! At least 50 runners finished before midnight. 93 of us in total finished the Midnight Owl. What a hoot! Next Race: Hyland 7 Mile Trail Race–the final Endless Summer Trail Run Series (ESTRS) race of summer 2016! I missed out on July’s ESTRS at Lebanon Hills Regional Park so I’m super pumped to catch the last one.